For a couple of days, we have been monitoring the potential for winter weather with our next system arriving this weekend. The setup is a fairly decent one for winter weather in the Mid-South - low pressure passing by to our south and an upper-level disturbance moving in on it's heels, just as cold air is drawn into the backside of the departing surface low. The questions have centered on when the precipitation moves out and how cold it gets in the lowest few thousand feet of the atmosphere before that happens. Computer models have been insistent - in their own ways and with each new run of that model - on the solution. The problem was that they didn't agree among themselves. It was an "agree to disagree" situation that made the meteorologist the mediator. That changed this morning. The bullish NAM model, whose stance had called for a good 2-4"+ of snow Saturday night for the metro for several "runs" (the models generally produce a forecast run four times a day), abruptly changed course with it's morning run. Usually you'll hear me say that I don't get too excited about extremes when models flip-flop like a pandering politician. In this case though, the NAM flipped over to come more in line with the other models. The result is now that the NAM, GFS, and European models all are pretty much in line with the big picture, with only subtle difference in the details (including that the NAM is still slightly stronger with the upper-level disturbance and perhaps a tiny bit colder). 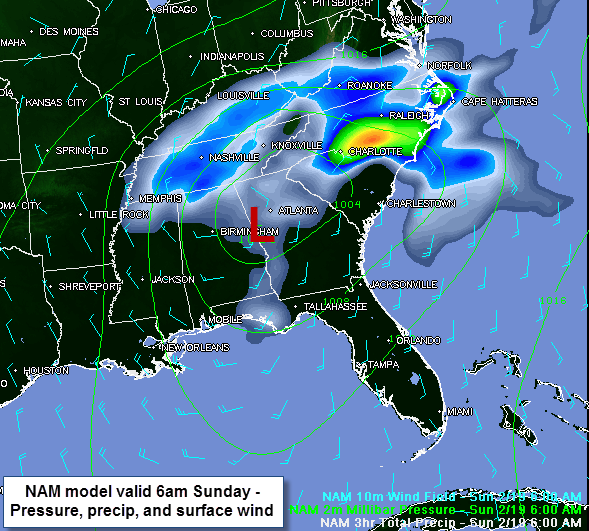 12Z NAM model indicates precip lingering over the metro at 6am Sunday as cold air filters in on north wind behind the departing low pressure system over eastern Georgia. The model consensus now appears to be a wet (rain) period from Saturday afternoon until well after midnight Sunday morning, followed by cooling temperatures in the early hours Sunday morning that could cause some of the rain to change to, or mix with, light snow. The most likely time for any snow would be from about 4-9am Sunday if the morning models are correct. With warm temperatures ahead of the system and temperatures remaining above freezing throughout the period of potential snow, I don't expect any problems on local roadways Sunday and only minor accumulation (if any) on grassy or elevated surfaces that would quickly melt as snow ended. Areas to the north and east - northwest and middle TN, western and northern KY - have the potential for more accumulation.